Blog - 10% Discount on our Microsoft Software Deals and More Products! 10% Discount on our Microsoft Software Deals and More Products! Take advantage of our Microsoft software deals for this week! 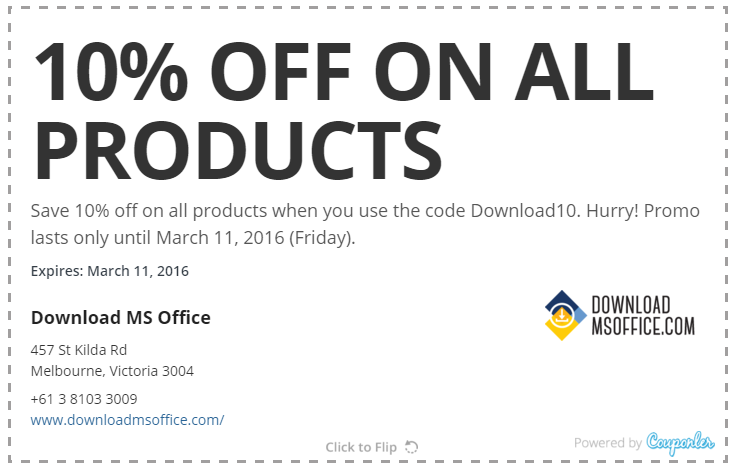 We offer 10% discount on all products available through the shop until March 11, 2016 (until 11:59 PM, Friday night). Head over to www.downloadmsoffice.com, choose a product you are interested with, add the item to your virtual cart, and checkout. Look for the Discount Codes box and enter Download10 to avail of the promo. We also offer the best deals for numerous products. Go to the home page and find bestsellers available in discounted prices. There are more items with existing deals you can take advantage of. Just browse the shop and find them! Please note that items which are currently on sale are no longer eligible for this week’s 10% discount. In the event that the product is out of stock, you may either wait for the restocking or order a different item instead. How about an upgraded version? You are also paying for a digital download only and no physical product is shipped. This means that you are making a payment for a license to use this software. Your license or product key is deployed via email along with download and installation instructions. This promo is also available in Australia only. So before you purchase outside this region, please contact us first for more information.